“Well, is he [bin Laden] the enemy?... Or is this man [Saddam] the enemy? The enemy is none of these people I have showed you here. The enemy is a spiritual enemy. He's called the principality of darkness. The enemy is a guy called Satan." I don't have a problem with people traveling about the country dishing up slide shows to fundamentalist Christian audiences telling them that Satan is behind terrorism -- other than it's a ridiculous dumbing-down of some very serious business. People in military uniform should retain their right to free speech, although I doubt if a lieutenant general was going around the country telling folks that the war on terrorism was a sham, it would be so easily forgiven by administration and military officials. The real problem is that our main protagonist, Lt. Gen. William "Jerry" Boykin, the former commander of Army Special Forces is, as NBC News reported, currently operating as part of a secretive new Pentagon unit aiming "to coordinate intelligence on terrorists and help hunt down Osama bin Laden, Saddam Hussein and other high-profile targets." In other words, he is in a very sensitive government position, one that renders continued fulminations about Satan, and selling the war on terrorism as a war against Christians as preposterous. Why do they hate us? 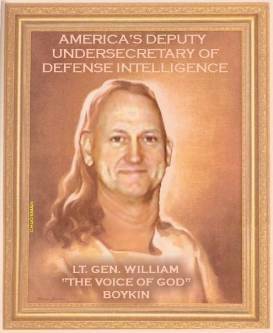 Because the US is a Christian Nation, Boykin says frequently and confidently. Boykin also has the chutzpah to think that though George W. Bush lost the popular vote, he was "appointed by God" to serve in these difficult times. In CounterPunch, Elaine Cassel makes an excellent case for allowing -- even encouraging -- Boykin to keep on talking. "Why? Because his comments are the unvarnished versions of the beliefs held by George Bush, Paul Wolfowitz, John Ashcroft, Tom DeLay, Bill Frist, and others in the administration who hold extremist religiopolitical views." "And then we began to see this face... the face of Osama bin Laden. And finally we said, 'There's the enemy. That's our enemy. That's the man that hates us. And all of those that follow him." "And then this man stepped forward. A man that has acknowledged that he prays in the Oval Office. A man that's in the White House today because of a miracle. You think about how he got in the White House. You think about why he's there today. As Mordecai said to Esther, 'You have been put there for such a time and place.' And this man has been put in the White house to lead our nation in such a time as this. "But who is that enemy? It's not Osama bin Laden. Our enemy is a spiritual enemy because we are a nation of believers. You go back and look at our history, and you will find that we were founded on faith. Look at what the writers of our Constitution said. We are a nation of believers. We were founded on faith." "And the enemy that has come against our nation is a spiritual enemy. His name is Satan. And if you do not believe that Satan is real, you are ignoring the same Bible that tells you about God. Now I'm a warrior. One day I'm going to take off this uniform and I'm still going to be a warrior. And what I'm here to do today is to recruit you to be warriors of God's kingdom." Lt. Gen Boykin has been party to "almost every recent U.S. military operation, from the ill-fated attempt to rescue hostages in Iran to Grenada, Panama, Colombia, [and] Somalia," NBC News reports. He believes that terrorism is being directed not by Osama bin Laden, Saddam Hussein or a passel of wannabe outlaws in Asia or the Middle East: It is being guided by Satan. When you get right down to it, ill-fated appears to define Lt. Gen. Boykins' career: The failed rescue op in Iran; Ronald Reagan's seriously sexed-up invasion of Grenada; George H.W. Bush's Noriega smack-down, which killed several thousand innocent Panamanians; US intervention in Colombia, which has barely put a dent in the drug trade; the tragedy of Somalia where US troops and hundreds of Somalians were killed. He was also, reportedly, in on the planning of the assault on David Koresh's compound in Waco, Texas. In April of this year, Boykin, as commander of Fort Bragg's training center for special operations forces, invited "a group of predominantly Southern Baptist pastors to the base... to participate in a military-themed motivational program for Christian evangelists," the New York Times' Laurie Goodstein reported. "It's completely inappropriate to have the Army put on a revival meeting at a military base, and that is the bottom line of this event," said the Rev. Barry Lynn, executive director of Americans United, told Goodstein. In mid-October, after Boykin's remarks were exposed by NBC News and the Los Angeles Times, religious groups immediately asked that he be reprimanded by President Bush. "Putting a man with such extremist views in a critical policymaking position sends entirely the wrong message to a Muslim world that is already skeptical about America's motives and intentions," Nihad Awad, the executive director of the Council on American-Islamic Relations, told the Washington Post. But Air Force General Richard Meyers, chairman of the Joint Chiefs of Staff, told reporters that "at first blush, it doesn't look like any rules were broken." Several senators said they would look into the matter. Predictably, over at David Horowitz's FrontPageMagazine.com, Lowell Ponte, a right wing radio talk show host, blamed the outing of Lt. General Boykin on the "leftist media," claiming that "the Leftist media has kept [half the story] hidden." The reality, writes Ponte is that the "leftist" media organized this "apparently coordinated" attack on Boykin "because by hitting him Leftists can now damage President Bush." What's the big deal, the media watchers at the conservative Media Research Center's CyberAlert sarcastically observed: "Stop the presses! A Christian man has expressed Christian views while speaking inside some Christian churches." Boykin may be loose-lipped during his in-church slide shows, but he's no dummy. Back-peddling faster than a National Football League cornerback, he recognized that his remarks might be considered beyond the pale. He apologized to "those who have been offended by my statements," maintaining that he was "not anti-Islam or any other religion." In his short statement, Boykin said, "I am neither a zealot nor an extremist, only a soldier who has an abiding faith." He had earlier told NBC News that he would rein in his speeches in the future; "I don't want ... to be misconstrued. I don't want to come across as a right-wing radical." The Lt. Gen. got one thing right: His remarks clearly express the sentiments of right-wing radicals. * Limbaugh's Rush to Darkness: Rush Forced to Resign from ESPN Gig but Has He Been Swallowing Bitterer Pills?